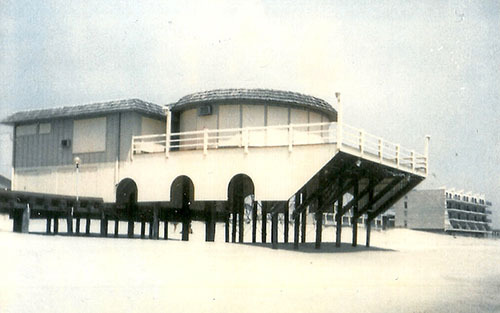 Legendary developer James B. Caine built his summer home — known as “Crystal House” directly on the beach just north of the Carousel Hotel in 1968. The cottage featured a living room with a fountain in the middle, three bedrooms and three bathrooms with sunken tubs and square toilets. Built on pilings, the Crystal House extended into the surf during high tides. Caine’s cottage created controversy from the beginning and played a role in arguments about public beach access vs. private ownership rights. Bobby Baker of the Carousel Hotel and Washington, D.C., political fame unsuccessfully filed suit to have it declared a public nuisance and torn down. Caine sold the house in the 1980s and the state of Maryland bought it from a later owner. In July of 1990, the state had it quietly removed and today no trace of the Crystal House remains on the beach at 118th Street.